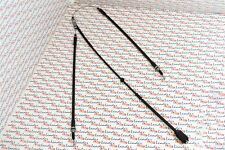 BKB2680 BORG & BECK BRAKE CABLE - INTER fits Vauxhall Combo 01- NEW O.E SPEC! VAUXHALL CRESTA PA WITH OVERDRIVE. SPEEDO CABLE. VAUXHALL VISCOUNT PC. SPEEDO CABLE. VAUXHALL VENTORA WITH OVERDRIVE. SPEEDO CABLE. VAUXHALL VICTOR FD 1600 2000 2300. SPEEDO CABLE. 1967 - 1972. VAUXHALL Astra H Mk 5. from 2004 to 2009. for Hatchback models with Rear Disc Brakes. Can't find what you're looking for?. Looking to place a bulk order?. to fit the following vehicles (not for Estate). 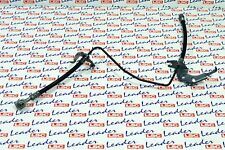 Lot Cable frein a main pour VAUXHALL OPEL CORSA B Reference OE: 90445985, 90538700, 0522 615, 0522615, 0522 643, 0522643, 522 643, 522643, 90445986, 90538699, 0522 614, 0522614, 0522 642, 0522642, 522 642, 522642, 522615, 522614 Compatibilite : 1 CORSA B (73_, 78_, 79_, F35_) 1.0 i 12V 54 CV - de 11/1996 à 09/20001.2 i 45 CV - de 03/1993 à 09/20001.2 i 45 CV - de 03/1993 à 09/20001.2 i 16V 65 CV - de 03/1998 à 09/20001.4 i 60 CV - de 03/1993 à 09/20001.4 i 16V 91 CV - de 09/1994 à 09/20001.4 i 16V 90 CV - de 09/1994 à 09/20001.4 i 16V 86 CV - de 08/1997 à 09/20001.4 Si 82 CV - de 03/1993 à 09/20001.5 D 50 CV - de 03/1993 à 09/20001.5 TD 67 CV - de 03/1993 à 09/20001.6 GSI 16V 109 CV - de 03/1993 à 09/20001.6 i 16V 106 CV - de 09/1994 à 09/2. Please read full listing description carefuly before you order to make sure the part does fit your car. 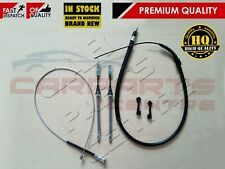 - VAUXHALL ASTRA H MK5 HATCH 05-11 COMPLETE HANDBRAKE CABLE MODELS WITH REAR DISC. Primastar - all models - from July 2002 to 2013. Vivaro - all models - from 2001 to 2013. Trafic - all models - from 2001 to 2013. N/S cable is 1498 mm long. O/S cable is 1598mm long. We are a family run motor factors in Midlothian, Scotland. 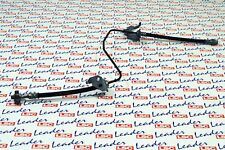 A FULL SET OF REAR HANDBRAKE OR BRAKE CABLES FOR ALL VAUXHALL CORSA C MODELS THAT HAVE NO ABS AND HAVE REAR DRUM BRAKES. Vauxhall CORSA Mk II 1.0i 12V. Vauxhall CORSA Mk II 1.2i 16V. Vauxhall CORSA Mk II 1.3 CDTi. 1 x NEARSIDE CABLE (LARGE) 1 x OFFSIDE CABLE (THIN SMALL ONE) 2 x SHORT CABLES TO FIT INTO THE DRUMS 2 x GUIDE RAILS OE QUALITY FITS VAUXHALL CORSA C 2000-2006 ALL MODELS FOR MODELS WITH DRUM BRAKES ONLY! PLEASE LEAVE VEHICLE REGISTRATION NUMBER AFTER PURCHASE TO AVOID ANY DELAYS IN THE DELIVERY PROCESS!. Câble frein main Vauxhall Astra Belmont 1.3 1.6 1.8i 1.7 D FEBI BILSTEIN. TRW Câble de frein à main OPEL ZAFIRA VAUXHALL GCH2513. Câble de frein à main pour Vauxhall Zafira 1.6 CNG BOSCH. OPEL ASTRA H (A04) 1.2 (L48) Hatchback Petrol 08/2005 10/2010 FWD 16 80 59. OPEL ASTRA H (A04) 1.3 CDTI (L48) Hatchback Diesel 08/2005 10/2010 FWD 16 90 66. OPEL ASTRA H (A04) 1.4 (L48) Hatchback Petrol 03/2004 10/2010 FWD 16 90 66. Câble frein à main Vauxhall Carlton 2.4i 2.6i 3000 3000 CAT ATE. NISSAN Primastar. VAUXHALL Vivaro. RENAULT Trafic (Mk II - X83). N/S (LHS) cable is 1465mm long. O/S (RHS) cable is 1365mm long. Can't find what you're looking for?. Looking to place a bulk order?. Available at checkout for £3.99. Zafira A (98-05). Zafira B (05-12). Genuine Vauxhall. Astra G (98-04). Astra H (04-10). 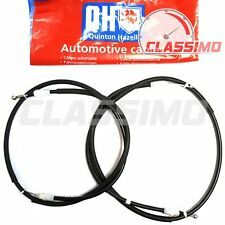 Pair of Rear Left & Right Brake Flexi Hoses. & Pipe with Fixing Brackets. Combo C (01-11). NISSAN Primastar. VAUXHALL Vivaro. RENAULT Trafic. 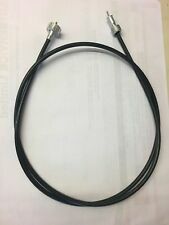 Cable is 1000mm long. FOR SHORT AND LONG WHEEL BASE MODELS (SWB & LWB). Available at checkout for £3.99. Can't find what you're looking for?. Looking to place a bulk order?. QUINTON HAZELL front handbrake cable for OPEL CORSA C Drum/Disc Brakes 2000 to 2007,OPEL TIGRA B 2004 to 2010,VAUXHALL CORSA 2 Drum/Disc Brakes 2000 to 2007,VAUXHALL TIGRA 2004 to 2010,VAUXHALL CORSA 2 VAN 2000 to 2003. VAUXHALL COMBO Mk II (C) Box Body / Estate (F25) 1.4 i 16V Box Body / Estate Petrol 01/2004 11/2011 FWD 16 90 66. VAUXHALL COMBO Mk II (C) Box Body / Estate (F25) 1.3 CDTI 16V Box Body / Estate Diesel 09/2004 02/2012 FWD 16 69 51. Câble frein main Vauxhall Corsa 1.4i 16V 1.6i 16V 1.6 GSI 16V BOSCH. Type de freinage : frein à tambour. - Des plaquettes de frein. 1997 : Début de l`échange standard sur le pompe de direction.1999 : Lizarte obtient la certification ISO 9001.2001 : Début de l`échange standard sur les compresseurs de climatisation.2003 : Lizarte obtient la certification ISO TS 16949. Câble de frein à main Vauxhall Astra Belmont 1.6 S 1.7 D ATE. VAUXHALL Astra H (Mk 5). all estate models. from 2004 to 2009. Can't find what you're looking for?. Looking to place a bulk order?. to fit the following vehicles Available at checkout for £3.99. Câble frein main Vauxhall Vivaro 1.9 Di DTI 2.0 16V 2.5 ATE. Opel / Vauxhall Vivaro [2001-2017]. Car : Opel / Vauxhall. OEM Part Numbers . ALL ENGINES PETROL AND DIESEL. Vauxhall CORSA C (00-06). CORSA 2000--2006 ALL MODELS WITH REAR BRAKE SHOES FITTED,NON ABS.;. Câble frein main Vauxhall Nova 1.0 1.2 S 1.3 S 1.4 S 1.5 TD ATE. Câble frein main Vauxhall Corsavan 1.7 DTI 16V 1.3 CDTI 16V ATE. 1 x NEARSIDE CABLE (LARGE) 1 x OFFSIDE CABLE (THIN SMALL ONE) 2 x SHORT CABLES TO FIT INTO THE DRUMS OE QUALITY FITS VAUXHALL CORSA C 2000-2006 ALL MODELS FOR MODELS WITH DRUM BRAKES ONLY! PLEASE LEAVE VEHICLE REGISTRATION NUMBER AFTER PURCHASE TO AVOID ANY DELAYS IN THE DELIVERY PROCESS!. Câble de frein à main pour Vauxhall Astra 1.6 SI BOSCH. Câble frein à main Vauxhall Corsa 1.0 12V 1.2 16V 1.7 Di 16V ATE. Primastar - all models - from July 2002 to November 2009. Vivaro - all models - from 2001 to 2013 (to chassis no. Trafic - all models - from 2001 to November 2009. Cable is 600 mm long. We are always happy to help and give advice. ). Câble de frein main Vauxhall Corsa 1.7 CDTI 16V 1.3 CDTI 16V BOSCH. 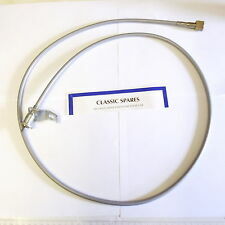 YOU ARE BUYING ONE COMPLETE REAR HAND BRAKE CABLE FOR A VAUXHALL ASTRA G MK 4 FROM 1998-2004,FOR ALL VEHICLES WITH BRAKE DISCS FITTED ON THE REAR. We are here to help. We hope you are happy with your products and service from Universal Car Parts Warehouse Ltd ®.